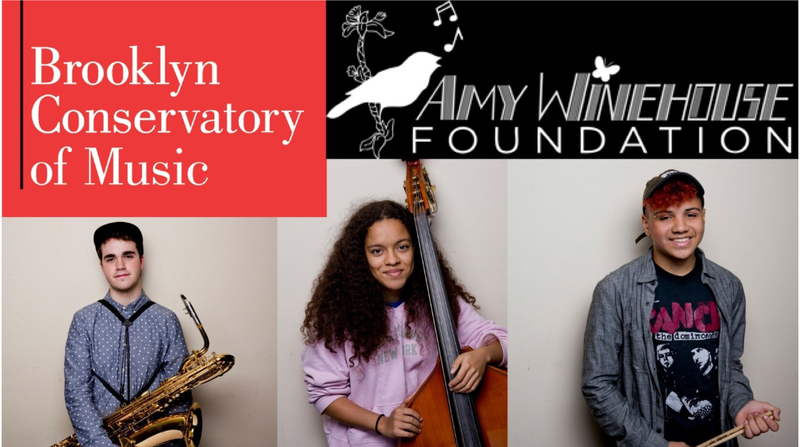 Brooklyn, NY: The Brooklyn Conservatory of Music (BKCM) is thrilled to announce that thanks to a naming grant from The Amy Winehouse Foundation (AWF), its Teen Jazz program has been re-launched for Spring 2017 as The Amy Winehouse Teen Jazz Intensive. The gift of $50,000 expands upon AWF’s past support of teen jazz at BKCM, and subsidizes tuition for the program’s students over two years. The Amy Winehouse Teen Jazz Intensive fills a crucial need within the New York City pre-college landscape for affordable, immersive jazz music education. The funding allows students’ families to pay on a sliding scale, based upon need, and those paying full price will pay only about one-third of the market rate for a program of its kind. The Brooklyn Conservatory of Music, a 120-year-old institution in Park Slope that provides music education and music therapy to more than 7,000 kids and adults each year, aims to give young people the tools and experiences to lead more empowered, empathetic, and joyful lives through music. BKCM’s extensive outreach programs provide music instruction and therapy to 60 schools and community centers all over New York City, most of which serve children in need. The Amy Winehouse Foundation, established in Amy’s honor on September 14, 2011, works to support, inform, and inspire vulnerable and disadvantaged young people through music education and music therapy, to help them reach their full potential. They also work to prevent the effects of drug and alcohol misuse on young people. Amy’s mother, Janis, was born in Brooklyn, and supporting New York City’s young musicians was a cause which Amy, herself, held dear. Directed by esteemed jazz educator Bill Stevens, The Amy Winehouse Teen Jazz Ensemble is comprised of talented teens from widely diverse socioeconomic backgrounds and offers them the chance to enhance their musical knowledge and skills by interpreting, improvising, and performing various styles of jazz and blues, as well as collaborating with revered guest musicians. Join us in welcoming Brian Drye, new community music school program director! NEW Brooklyn Public Library Instrument Lending Library + A Special Promotion! Dear Evan Hansen Singalong was a HIT! Exploring the Metropolis Announces 2017-18 ConEd Composer in Residence at BKCM!